we provide quality temporary housing in Boulder Colorado with personal service. Corporate Rentals in Boulder are a great alternative to hotels for extended stays in Boulder. Fully furnished temporary Apartments, Condos, and Houses equipped with all the comforts of home- a great alternative to a Boulder hotel stay. And you will enjoy more comfort and more amenities at a lower cost than most Boulder hotels. Hotels in Boulder can average $150 to $250/night and even higher for a one room suite. Corporate Apartments in Boulder typically average $50 to $70/night for a full sized apartment with fully equipped kitchen, washer/dryer, local phone calls, cable tv, high speed internet, and parking all included in the rate. In fact, more than half of the visitors to our corporate apartments are in need of temporary housing for reasons outside of a job relocation. Many are in between buying and selling a home and require interim housing while they shop for a new home. Others already live in the Boulder area and are remodeling their home, and find that staying in a fully furnished corporate apartment is more convenient than moving temporarily. Unfortunately if you have a fire, flood, or other disaster in your home then a corporate apartment is a place to stay while your property is restored. Most insurance companies will reimburse for the cost of Additional Living Expense housing, or ALE housing, for your temporary housing expenses in a corporate apartment. We provide flexible invoicing to insurance companies so you can get re-imbursed for the cost of your corporate apartment for and insurance claim. We have the largest selection of furnished apartments and temporary housing in the Boulder and Temporary Housing Denver areas. Choose from luxury executive homes, turnkey condos, and full service corporate apartments in downtown Boulder. We have locations in neighborhoods close to schools, restaurants, hiking, parks, and residential areas. Wherever you choose to stay with us, our corporate housing team are professionals that take care of all the details for you from check-in to check out. Contact us today to book your stay in Boulder! 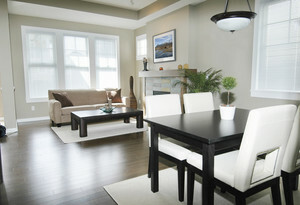 These beautiful furnished condos are located at the west end of the historic Pearl Street Mall in Downtown Boulder CO. Enjoy the convenience of turnkey living with all of your furnishings, linens, towels, cookware, dishes, cable tv, and high speed internet provided at no extra cost. Stroll the Pearl Street mall just steps from your front door. Available for month to month rentals, short term rental, or long term rentals in downtown Boulder. There is no better location for temporary housing in Boulder than these quality furnished executive rentals. Call us to book your stay at the Historic Mapleton Terrace 303-545-6000. 30-day stays or longer only please.